Born in Norway, but citizen of the world - a painter whose formation would not have been possible without extensive travels - driven by an insane will to learn from all countries, "reading" not only museums and monuments but also the behavior of people, the traditions, the customs, the fashions: Henrik Hagtvedt, 26 years old, carries within himself a particularly solid cultural fundament. His artistic ballast consists not only of scholastic experience and the formative impulses of philosophy and psychology, but also of specialized learning pertaining to geographically specified areas. Here, in fact, we see specialized artistic technique stemming from such diverse areas as Oslo and Amsterdam, London and Florence. The florentine influence consists partially of human anatomy and the abstract studies with Giulietti at the Academy of Fine Arts. Hagtvedt is a born painter of temperament, displaying the heritage which many of his kinsmen must be gratified to have in memory and spirit: the heritage of the great Munch. Such expressionism is the language through which Hagtvedt exposes his images. He does so naturally, as if he was speaking his native tongue. And as his esteemed compatriot at the end of the 19th century, he acquires, through the cultural span offered by his hosting countries, a sensibility to colour which transforms the images come about as almost monochromatic manifestations. Maybe this evolution of the palette initially attenuated the expressive intensity, but having accepted this change as a grammatical enrichment, the eloquence flows with the liberty of communication which Hagtvedt has exhibited possession of and which naturally stimulates his personality to reveal itself ever more fully. The arrival and stay in Italy, first of all Florence, have in my opinion played a particularly interesting role in this artistic journey of the nomadic painter. It is as if the mad coordinates are again functioning to locate the site, the space in which gather the values that Hagtvedt seeks. In search of himself he feels an extreme need of these values; one could say it is his own identity as a painter and a poet. Therefore, dramatic expression has reappeared in Hagtvedt's imagery, yet not entrusted solely to facial gestures that remind coldly and externally of the Scream; but to the situations, the environment, the psychological reading of the subjects. Through this we see the maturity of this painter, who today analyses more profoundly that which he offers. And he does so with greater consciousness of his acquired values. It is probable that Hagtvedt, urged by the demon that blesses his nomadic way, will set out again on the search for new sensations. From these he will undoubtedly extract ulterior cultural enrichments. One would think, however, that the florentine impulses are destined to leave substantial traces in his art and in his continued exchange with other countries and cultures, with the diverse rituals that accompany new understanding. Hagtvedt is a 27 years old Norwegian: notably young for an artist so rich with experience. 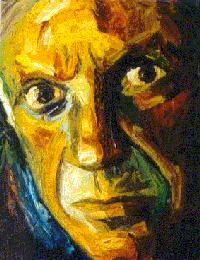 The tradition fathered by Munch, who died in 1944, is certainly evident. One must say that the colour and stroke of these canvases bring Munch to mind. Still, Hagtvedt is a curious painter, transversing at least two score countries, studying and occupying himself with every expressive element. In Italy (for the most part Florence) he has remained for an extended period of time, and it is here that I have become aquainted with his work. It is, however, not easy to define Hagtvedt. He works with a severe chromatic intensity through which he manages to communicate the drama of his "protagonists". His reds and greens have a vehement and profound quality, and he is always concerned with the painful character of mankind as it confronts the problems of his life. His images emerge from a darker background which renders them all the more effective. The situations in which we find ourselves implicated, create the circumstances of our discomfort and anxiety. The men and women which Hagtvedt paints, his male and female portraits, belong to an alarmed universe where the spiritual tension arouses in us upsetting agitation. This is why he transmits such restlessness. Through every figure of his "repertoire", he composes and verifies the concrete truth of his fantasies. While exploring himself, Hagtvedt's will manifests itself with resolute determination. He uninhibitedly reveals the substance of his visions, of his creative inspiration. The grave sentiment of our generally unhappy fate undoubtedly lies at the root of his worries, and he announces this as surely as we suffer. But what matters is Hagtvedt's capacity to represent such unhappiness in his works, not through abstract panic but through the certainty of concrete imagery. Without a doubt, this is what particularly distinguishes Hagtvedt. Through his images, he revives the sense of both reality and symbolism. This sense enables him to present his discourse in a different manner, while the obligation of being faithful to himself is still maintained.